Poop Happens Discounts Apply ! 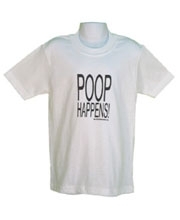 Poop Happens is probably the all time funniest little kids shirt. Life just happens when you're a toddler, and there's just not that much you can do about it. Maybe that's why they have such a cheery disposition in life. 100% Satisfaction Guarantee. See our Policies page for details. Optional Gift Wrapping. See our Gift Wrap page for details.